The Earth is constantly being bombarded with cosmic rays, high-energy particles from exploding stars. The Svensmark Cosmic Ray Theory suggests that when these cosmic rays enter the Earth’s atmosphere, they help create clouds. An active sun strengthens a magnetic shield around the Earth that lets fewer cosmic rays get through. If the sun is less active, more cosmic rays get through. And the more cosmic rays, the more clouds, and the cooler global temperatures will be. All-in-all this is a treasure trove of results (and potential future results) for people tasked with trying to model or understand aerosol processes in the atmosphere. But as to establishing cosmic rays as the cause of global warming, no cigar. [The paper] actually says nothing about a possible cosmic-ray effect on clouds and climate, but it’s a very important first step. While their results provide some confirmation of the potential mechanism by which GCRs might induce cloud nucleation, they in no way demonstrate that GCRs do significantly promote cloud formation in the real world, let alone support the myth that GCRs drive significant climatic change. Basically, what’s actually been demonstrated by Kirkby, et al. isn’t at odds with the IPCC. What is at odds with the IPCC hasn’t been demonstrated by Kirkby, et al. And the claims by Svensmark, Shaviv, and other ‘GCRs [galactic cosmic rays] drive climate’ proponents have been debunked at pretty much every step of the way. GCRs may have some influence on cloud behavior, but they’re not responsible for significant climatic changes now or in the geologic past. It takes a special kind of mind to see cosmic rays as the dominant cause of global warming. OK, Brian I’ll bite. After all, I’d like to think that I have a “special kind of mind.” It isn’t the kind of mind though that will simply swallow without asking any questions RealClimate and Skeptical Science doing what they do best – set up a straw man and then claim nothing to see here folks, move along please. You have to be really special for that. OK, first set of results and all that, but this is a very significant issue which potentially goes to the heart of the sceptics case: the increasing number of inadequacies which are appearing in the climate models. Given how great an effect a small change in overall cloudiness can have on temperature, the simplistic nature of the way they treat cloud formation is one of the most concerning of these. CERN suggests that it is even more simplistic than it has previously appeared to be. Oh, and PS: you do yourself no favours presenting that Pew graph as if it means something, especially in its extraordinarily precise correlation since 1965. It plots two different quantities on its y axis, measured by different metrics, to arbitrarily chosen scales and and starting neither of them at zero. With that sort of flexibility available, if any two quantities are trending even vaguely in the same direction is possible to produce apparently close correlations that prove, like this one, nothing very much at all. My personal favourite is the irrefutable evidence that pirates are responsible for global temperature , though some claim the causality goes the other way. You appear to be right to say that the graphs show that cosmic rays are not the explanation for the upward trend in temp post 1950. Wazza: re your second comment, try looking up ‘normalisation’. It’s completely valid and standard analysis step for comparing such signals. I think the RealClimate title says it all: very interesting results, but that’s about as far as it goes. Wozza, I don’t have time for a full reply, but here’s something to go on with. I know that the direct effect of CO2 on warming is relatively small, and that the full effect on temperature comes through feedbacks. But deriving the relative effects of those additional feedbacks and other forcings is only partly based on models and observations over the last century or so. You need to look also at the paleoclimate record. I referred to Hansen et al’s latest work in the first item of Climate clippings. Inter alia they look at aerosols and variations in solar radiation. The relative strength of the latter may be seen in Figure 1 of this paper. To give a major role to solar and cosmic rays you have to assume that the effect works through cloud formation. The effect of cloud formation is very moot at this stage. There are clouds and clouds, and the effect of some of them at least appears to be close to neutral or even mildly on the warming side. 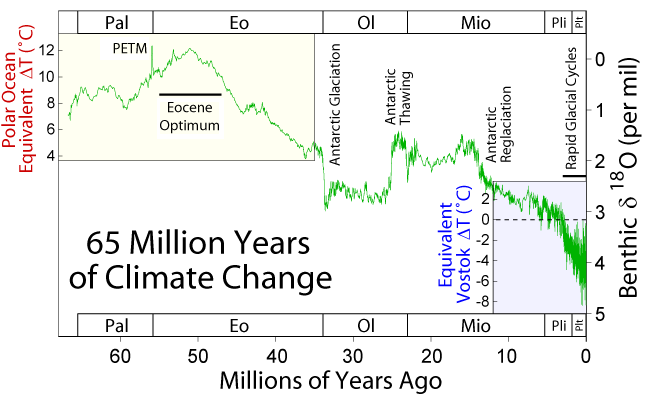 At present the CO2 connection appears much more straight forward scientifically, and also makes sense in the context of what has happened in the last 65 million years. On the Pew Centre graph, of course the two graphs displayed need to be deconstructed in the light of the x and y axes and how they are displayed. That’s true of all graphs. What they do show is distinct uptrends that started soon after heavy industrialisation after WW2. The graphs chosen are pretty standard stuff and there hasn’t been significant manipulation that I can detect. What’s misleading about them is that they might lead the reader to think that there was a simple one to one relation between CO2 increases and temperature rise. It’s easy to start the CO2 graph from zero. If we did that we’d see about a 40% increase from pre-industrial times. But with temperature, where do you start? At zero Kelvin? I think there would be a case for starting at -15C which is what we’d have without a greenhouse effect. In that case 0.8C increase would give you a 2.6% increase. But every 1C increase since the Last Glacial Maximum gave us 20m of sea level rise. Because of this and other effects we could be forgiven for wanting to look at the changes in more detail. FWIW, here is a CO2 graph. If you go here you’ll find a 5-year and an 11-year running average superimposed. Here is the source of the Pew Centre graph. It looks similar to this one from the Hadley Centre. It looks to me like a smoothed 5-year running average. They say it has been smoothed with a 21-point binomial filter, whatever that means. Unfortunately the Pew graph stops at 2005, thats 6 years ago. Can one ask whats happened since? If the correlation between CO2 and temprature were that good, I’d agree that controlling carbon dioxide might help. Unfortunately it isn’t, and controlling carbon dixide will have an immeasurable effect on the worlds climate. PS Drove past the solar energy storage project at Whyalla yesterday. They have started work again, but the dish is still upside down on the ground. John, certainly you can ask what’s happened since and we’ve dealt with that from time to time. I suspect that in 2030 the graph will show a bit of a decadal wobble, of which there’s been a number before. There are explanations for these wobbles, which in part include variance in solar activity. If you go here and scroll past the first graph, which is a superimposition a la Pew, you’ll come to two graphs meant to show the relationship between variations in CO2 and temperature over the last 400,000 years. If you superimposed those graphs you’d see significant anomalies lasting thousands of years. There may be measurement problems or other things at work. Think here of Younger Dryas, Heinrich events and Dansgaard–Oeschger events. All these phenomena co-exist quite comfortably with the AGW story. But with cosmic rays there isn’t a story with significant explanatory power as yet and to me it just doesn’t look a good bet. Frankly I haven’t trusted much about paleoclimate work since the gross cherry-picking of data involved in much of it (eg the now you see them, now you don’t, Yamal trees, and Mann’s blatant “OK I’ll use paleoclimate data as long as it fits my trend I, and when it doesn’t I’ll stop using it and splice a completely unrelated data series on instead, trying to retrofit data to a pre-existing conclusion, who, me?”) came to light. However, leaving that aside, my basic point is simply your “the effect of cloud formation is very moot at this stage”. Indeed it is – both in the knowledge of how clouds are formed, and, as you point out, how they impact once they are formed – and while there is so much mootness on an issue of this potential importance, the modelling is very moot as well. And CERN has added to the mootness to at least some degree. That was all; I was not carrying a torch for Svensmark necessarily. On the graph, yes, I understand the problem, it was the misleading nature of the presentation which you acknowledge that I was referring to, not its numbers per se. Pew have form. Egad! The denialists are truly getting desperate – cosmic rays! I look forward, without any confidence, to the headline in the Australian ‘Landmark study confirms climate denialists only interested in personal gratification’. Alarmists Got it Wrong, Humans Not Responsible for Climate Change: CERN in the International Business Times (site not responding right now) and plenty more like that, completely over-egging the research. Svensmark claimed it validated his research. Wozza, sorry to tell you that Mann was completely cleared several times over in his research and the shape of his famous graph has been confirmed in later studies. But you need to go back way further than the last 1000 years and beyond the northern hemisphere. Have a look at a couple of recent papers by Hansen et al here and here where they go into various factors in climate sensitivity and areas of uncertainty pretty thoroughly. There is an interesting article in New Scientist on the CERN study. Note also this linked page. Brian, in regards to the CERN article, it is well known fact that the formation of ice is required for cloud formation, snow and most rainfall. Dust and soot particles can serve as ice nuclei, however biological ice nuclei are capable of catalysing freezing at much warmer temperatures. The process is called Bioprecipitation and ice-nucleating bacteria, such as Pseudomonas syringae, is a relative common plant pathogen, are used in cloud seeding. Thanks Ootz. I’m not up on the detail of cloud formation. I take it the CERN study finds that biological material is “far more important” than previously thought, which is of interest, but of most interest is that it doesn’t seem to have any implications for the AGW paradigm. Brian @13: “but of most interest is that it doesn’t seem to have any implications for the AGW paradigm”. Well, that depends what you mean. “Paradigm” is not really a scientific word. I would agree if you are saying that CERN has not at a stroke overturned the entire theoretical basis of climate science. But Ootz’s point is (I think) along the same lines as mine. So is your New Scientist article. The CLOUD results do say something significant about cloud formation, and thus about deficiencies in the GCMs. The modelling may not constitute a “paradigm”, but it is central to the narrative on the basis of which we are being urged by some to spend trillions and fundamentally reconstruct society. Anything that adds even further to the already not inconsiderable qualms about whether the reliability of the modelling is sufficient to embark on this course, can’t just be written off as without implications. I don’t know for sure, Wozza, but i would have thought that paradigm was a pretty good word to use in relation to AGW. I don’t think that it is the same as the different paradigms of Newtonian and Einsteinian physics, or plate tectonics and whatever else the geologists used before Wegener was pilloried so badly. What has changed is our place and the impact of human activity on the the planet. when i first heard about AGW in the 80’s the principle argument against it seemed to be that we puny humans couldn’t possibly have that kind of effect on the planet, (oh and Thatcher just wants to use it as a club to beat up the unions) i heard this argument repeated by Plimer not that long ago. The paradigm shift has been the acceptance that humans can effect the planet in this way and that the generation of co2 has been our main contribution. Brian, I don’t know why, but when i first read about this my instant reaction was to wonder when we would be hearing about Hoyle’s dust clouds, kind of glad we haven’t. Where do estimates of climate sensitivity come from? Contrary to popular belief, climate models are not the principal basis for assessing human-made climate effects. Our most precise knowledge comes from Earth’s paleoclimate, its ancient climate, and how it responded to past changes of climate forcings, including atmospheric composition. Our second essential source of information is provided by global observations today, especially satellite observations. which reveal how the climate system is responding to rapid human-made changes of atmospheric composition, especially atmospheric carbon dioxide (CO2). Models help us interpret past and present climate changes, and, in so far as they succeed in simulating past changes, they provide a tool to help evaluate the impacts of alternative policies that affect climate. Wozza, what knowledge have you got, that the Academy of Sciences have not got, for you to suggest that the two of us think along same lines. Please explain! Wozza, I thought Ootz was talking about the specifics of cloud condensation nuclei (CCN) as a process rather than the quantum and how that might relate to explanations of temperature rise over the last few decades. quokka, thanks for that brilliant link. 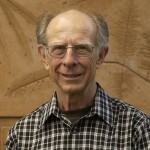 Elsewhere Hansen says that we have three kinds of information – direct observations, paleoclimate records and climate models, in that order of importance. The thing with climate sensitivity and long-term feedbacks is that you have to observe ice sheets disintegrating and re-forming multiple times. In these terms the the ‘recent’ past is the Pliocene and Pleistocene, that is, the past 5.3 million years. So paleoclimate information becomes your prime source observations, albeit indirect. dylwah @ 15, good points, both of them. On paradigms, from the link it seems that the modern usage of the term stems from Thomas Kuhn’s book book The Structure of Scientific Revolutions. The term does seem to be problematic, however. Your explanation is excellent. What I actually had in mind was a coherent and internally consistent body of knowledge. I don’t have access to the original article, but allowing what Wozza said @ 1, the best you can say is that the work is still in front of them. The prospects don’t seem to me to be good, however, because there is no trend in the variations of cosmic rays that is in any way shaped like the increase in temperature over, say, the last 60 years. In fact one suspects that cosmic rays will amount to little more than noise compared to the main drivers. On the fourth point (cloud properties), the last item I bookmarked on the effect of clouds was this one, or you could follow the other links I gave here. Clouds, of course, are notoriously hard to study, but on the information available there doesn’t seem to be much in it either way. If this is true then that does not leave much room for cyclic fluctuations of atmospheric energy sufficient to influence climate. Brian, you are missing the woods for the trees, in constantly returning to “establishing cosmic rays as the main driver of temperature change”. This is a tree. No doubt I am at least partially at fault in not being clear. Forget cosmic rays for a minute. RealClimate and Skeptical Science would like us to focus solely on this narrow issue, so we don’t look too hard the wider problem, and are pounding away accordingly at the team’s own straw man to encourage this. The broader issue is the role of clouds, their formation and particularly the role of aerosols. CLOUD has shown that the models’ current parameterisation for this is nowhere near reality. This is no surprise, but it is now confirmed in spades. Svensmark postulated that cosmic rays are the critical unconsidered factor in changes in cloud formation. It may or may not turn out that there is an element of truth in this – the initial CLOUD results are interesting in this regard but inconclusive. But the point is that what they have shown is that we have a major problem Houston in the models. The highlighting of the problem is the real news in CERN’s experiment, not the problem’s speculative solution via cosmic rays or anything else. Ootz, I am pretty sure we don’t think along the same lines (and I am pretty sure too that we are both thankful for that). I did think that on the particular point we were at least referring to the same issue – clouds, aerosols and the problems of treating them properly. I apologise if I was wrong. You do see what he has done there, don’t you? Satellites measure a lot of things, but they do not have a theory about what they are measuring, They thus do not actually “reveal how the climate is responding to human-made changes”. They show only that it is responding, to a whole lot of things. Measurements are value-neutral. Bait and switch, Hansen. As for paleo-climate, leaving aside the data difficulties (not to say manipulations), it shows a lot of things, including the fact that many times in the past CO2 levels have been considerably higher than they are today (or will be any time soon) and temperatures lower. This is always explained of course by the “it’s different this time theory”, about CO2 being the main current driver and other drivers being more important in the past. Perhaps, but at this stage you are into assumption and hypothesis, not observation ans measurement. The same problem as above in fact. Hansen needs to read up about circular arguments. And you do realise that the question for policymakers is in any case not what the paleo-climate was, but what the relatively near term future climate is likely to be? Wozza, thanks for that link. I realise that you are not making the claims being made extensively in headlines that the CLOUD experiment blows AGW theory out of the water. But Kirby and co appear to have incorporated an unwarranted assumption that clouds have a significant effect on warming. If they don’t, or not by very much, then you can fiddle with the nucleating end as much as you like and nothing much will change. What I’m saying is that there is no trend at the beginning of the cause and effect chain that seems to survive through to the end of it. In the case of galactic cosmic rays you’ve got a wavy line which if you draw a trend line through the last 60 years is essentially flat. At the other end you’ve got a distinct uptrend of temperature change. Certainly it would be nice to understand more about cosmic rays, nucleation and the role of aerosols generally. Hansen laments the fact the aerosols are not even being measures properly. He has proposed doing it, but funding has been denied. But for reasons I’ve just stated I’m not expecting further studies comic rays and cloud nucleation to make much difference to our overall understandings of AGW. I could of course be surprised. OK, Brian, thanks, I think we have now debated ourselves into a position of semi-agreement on CERN/CLOUD, if not on the bigger issues. I don’t disagree with that at all – well, “unwarranted” is probably overstating it, but the assumption is certainly unproven one way or the other. Don’t you find that alarming, for “settled” science? Anyway the point is that we are both now pointing to an “if clouds have an effect on warming” as still unanswerable. To go back to the nub of the problem for policy-makers, I for one do not regard this situation as representing science settled enough to bet trillions and the future shape of society on. “At the moment, it actually says nothing about a possible cosmic-ray effect on clouds and climate, but it’s a very important first step,” [Kirkby] says. The IPCC acknowledges that cloud feedback is the biggest uncertainty in how much warming will actually eventuate from the relatively weak CO2 forcing (though it then goes on only to use models that incorporate a positive feedback). Of course they only use those models, because those are the only models that reproduce past climate variations with any reliability. I for one do not regard this situation as representing science settled enough to bet trillions and the future shape of society on. As you note the IPCC reports carefully acknowledge and account for the uncertainties involved in their projections. Even allowing for these uncertainties they predict a large probability of significant climate impacts. Are you so certain about the science that you see no risk in continuing Business As Usual? I think we should wait for him to produce an actual cloud. Even then he wouldn’t be home in terms of a significant climatic effect. Wozza @ 23, I think Hansen’s explanation is perfectly clear and logical, whereas I can’t make any sense of your critique. Sorry! including the fact that many times in the past CO2 levels have been considerably higher than they are today (or will be any time soon) and temperatures lower. Again, I’m simply not aware of any instances. Rather the reverse. BTW Skeptical Science has posted on Dessler v Spencer/Brasswell and Lindzen/Choi. I’ve got nothing more to add, except that it was the Spencer/Brasswell paper that editor of the journal quit over. The reality that you appear to be unable to comprehend, Wozza, is that by taking no action on Climate Change is to gamble……everything that there is. That is a gamble ten thousand times greater. Nature has demonstrated many times in human history that even minor changes in climate eliminates civilisations. They were local fluctuations. What we are dealing with here is global climate change driven by massive accumulations of energy in the oceans. Nature has so many methods with which to make life intolerable. Now imagine all of that happening in rapid succession. Adaption??? Bullshight. This latest little desperate cling to hope of an alternative explantion doesn’t even pass the simplest primary test of knowledge. Cosmic Rays are the flux of particles flowing around the galaxy, a by product of the cycle of star formation. The time scale for this flux is millions and billions of years. There are anomalies such as the gamma ray burst that created one of the greatest of the seven extinctions of life. These bursts are extreme and very short in duration and may never happen at all in the life of a solar system. The Carbon14 data, Carbon 14 being a byproduct of Cosmic Rays and one of the very quantity stable elemental isotopes in the atmosphere, demonstrates that cosmic rays form a stable and very small background noise. The Cosmic Ray induced Aerosol influence, if there is any at all, on climate therefore will be constant, not fluctuating. Your great last gasp of denialism is dead in the water. Climate Progress has a post on Spencer/Brasswell. Unfortunately Spencer, Christy, Lindzen et al are serial offenders in producing bad and/or misleading science. I think the main benefit of getting a really good handle on the mechanisms and effect of galactic cosmic rays and clouds generally would be to close the door on the opportunities for these peopel to continue to mislead. BilB @ 31, galactic cosmic rays do seem to be a constant source in time scales that matter to us. But the number that get through to our atmosphere seem to wobble up and down by plus and minus 5-10% depending on solar activity cycles that last about 11 years. If the effect on temperature was significant, rather than just noise, you’d expect to see an imprint on the temperature graph. It simply isn’t there. More broadly, the role of CO2 and GHGs, together with the ice sheet response, in the planet’s energy balance and climate story over the last 65 million years and the 5 million years is well understood and makes sense. It is pretty much impossible to imagine the carbon cycle being displaced by cosmic rays and clouds as a significant factor. Andrew Dessler’s new paper (preprint here) makes it clear just how bad Spencer and Braswell (2011) is. Spencer and Braswell assumed that changes in clouds were a stronger influence on temperature changes than changes in ocean heat content. Dessler used observations to show that the ocean heat content is vastly more important. Oh dear. I thought that this thread was a relatively sensible discussion of CLOUD in particular and current knowledge of cloud formation/feedback in general. Now it seems to be back to business as usual – we don’t care about the uncertainties in the models, nature will blow us away if we don’t do something, won’t someone think of the children. Sorry, not going there. Totally unproductive. Some people need to learn what the concept of risk management actually is (and I am looking at you amongst others Martin B; no of course I am not sure there is no risk in business as usual, there can never be no risk in anything, I assume you never leave the house because of the risk of being run over by a bus). In other words, there remains significant and important lack of knowledge around clouds. Who’d have thunk it. “What is disturbing, however, in the Trenberth et al article is its tone and disparagement of two outstanding scientists. Instead of addressing the science issues, they resort to statements such as Spencer and Christy making “serial mistakes”. This is truly a hatchet job and will only further polarize the climate science debate”. Brian (@29), for heaven’s sake there have been actual ice ages at considerably higher CO2 levels than today’s. Yes, there were a number of other differences then from today’s conditions as well – orbital changes, vulcanism incidence, etc – but that is rather the point – there are numbers of climate drivers not just CO2. As for your not being aware of “relevant accusations” of data manipulation, try this one on Yamal tree data cherry-picking for starters, and there are plenty more where that came from. The whole hockey stick brouhaha was essentially about Mann’s innovative, to put it no more critically, use of data. You may regard the Yamal affair as having been satisfactorily refuted – many don’t – but it is hardly possible to say accusations have not been made. Why is my previous post in moderation? It appears that it was automodded, and I’ve only just logged in to look at the queue. I’m not quite sure which word triggered the modbot. Yes, there were a number of other differences then from today’s conditions as well – orbital changes, vulcanism incidence, etc – but that is rather the point – there are numbers of climate drivers not just CO2. I feel like this is a bit of a straw man here. I don’t think anyone is trying to argue that there aren’t other controls on climate. But just because climate changed in the past due to other controls (such as the ones you suggest), it doesn’t automatically follow that those controls are the dominant drivers of climate change today. Most of the cloud feedback uncertainty is due to cloud changes near the equator, in the tropics and subtropics (Stowasser et al. 2006). Studies by Lauer et al. (2010) and Clement et al. (2009) both looked at cloud changes in these regions in the east Pacific, and both concluded that based on a combination of ship-based cloud observations, satellite observations, and climate models, the cloud feedback in this region appears to be positive, meaning more warming. Dessler (2010) used cloud measurements over the entire planet by the Clouds and the Earth’s Radiant Energy System (CERES) satellite instruments from March 2000 to February 2010 to attempt to determine the cloud feedback. Dessler concluded that although a very small negative feedback (cooling) could not be ruled out, the overall short-term global cloud feedback is probably positive (warming), and may be strongly positive. His measurements showed that it is very unlikely that the cloud feedback will cause enough cooling to offset a significant amount of human-caused global warming. So while clouds remain a significant uncertainty and more research is needed on this subject, the evidence is building that clouds will probably cause the planet to warm even further, and are very unlikely to offset a significant amount of human-caused global warming. It’s also important to remember that there many other feedbacks besides clouds, and there is a large amount of evidence that the net feedback is positive and will amplify global warming. (links to references are on the original page). Brian (@29), for heaven’s sake there have been actual ice ages at considerably higher CO2 levels than today’s. Please tell me when. Have a look at these three images. When I referred to relevant accusations of data manipulation I had in mind those sorts of time scales and greater, not the Hockey Sick stuff, the significance of which is over-rated, and where, as I said earlier, Mann has been cleared of scientific malpractice in any case. Here’s a standard graph of climate forcings. I think it predates recent work on clouds. Obviously it would be good to have the matter of clouds pinned down more, but you’ll notice that the error bars on CO2 and other GHGs is not large. Volcanism doesn’t rate. You’re the one who needs to get out a bit more, rather than cling to discredited science from the 3% of people classified as climate scientists. We’re back to the Middle Ages aren’t we? I mean, that’s what they tried to do to Galileo, I mean, this is an extraordinary position for my country to be in. I always thought that we would be willing to have an argument, for sure. But sometimes I think ah, you know, how low can we go? How long should we go on? You claim that “we don’t care about the uncertainties in the models”. I assume the “we” means climate scientists, the US NRC, CSIRO, NASA, national science academies and so on. Much closer to the truth is that the so called “sceptics” do not care about the magnitude of uncertainties in climate science or about the likelihood that further resolution or partial resolution of those uncertainties will fundamentally alter the well established consensus that the principal driver of climate change are the GHGs emitted due to human activities. Consequently we have witnessed every few months purported “Galileo moments” with the release of some new paper accompanied by extravagant press releases and rubbish reporting in the MSM that supposedly demolishes all that has gone before. Mostly these papers disappear into the obscurity they deserve but some, possibly the CERN work, lead to improved knowledge. But they still do NOT invalidate the accepted science. If you are looking for a better analogy than Galileo from the history of science try Einstein. Revolutionary? Without doubt. Destroyed classical mechanics? No way. And we have yet to see a “sceptic” anything like Einstein. OK, as usual we reach a point at which no further discussion is useful. The interesting thing I take from this thread is that the determination only to consult approved sources extends to writing Judith Curry off as one of the serial offenders. That really says something. Jess, just for the record too, in closing, the 2010 Dessler paper that your quote is about has been overtaken by, amongst others, Spencer and Braswell 2011 and the (very rushed and showing it) Dessler response to that. See Judith Curry’s post and the thread folling it, linked above, for a good discussion of those. IMO, none of these papers are of particular scientific interest, although they have become important in the public debate. To be honest, I have limited time and haven’t followed Curry to date. Checking out her website just now my initial impression is that she has positioned herself as a centrist in what some people see as the climate debate. That, if I’m right, is a bias. But I’ll try to keep an open mind. Other than that, @ 42, I do in fact prefer not to waste my time on some sources. The issue for me is how do you tell whether an expert is any good if you lack that expertise yourself. One way is to ask an expert you trust. In the last 10 years I’ve had 6 surgical interventions. All excellent surgeons, selected by my GP. If a surgeon messes up it gets around the GP network. If anything resembling a peer review process existed among climate sceptics, you’d expect the lightweight Carter tests to have been disowned and their author admonished for bringing serious scepticism into disrepute. Serious scepticism about the AGW body of knowledge is hard to come by, but there are a fair few places where you don’t expect to find it. Absolutely false comparison. The risk of me being hit can be quantified and is very small. The risk of mainstream climatology being largely accurate can be quantified and is high. No it is not 100%, but it is high.